So I've done mini makeup shopping again. 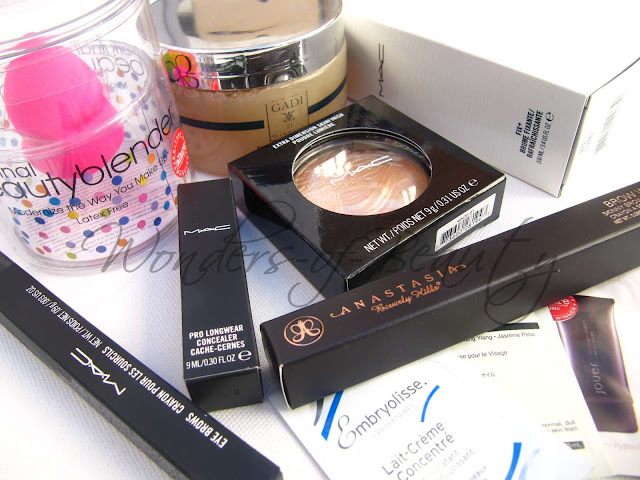 This "What's New" post has a couple of repurchases but also products which I've been trying to get my hands on for a while and I've finally succeeded! I'm lazy so as usual, the majority of these items were purchased online. I think I also just love the excitement of receiving packages! 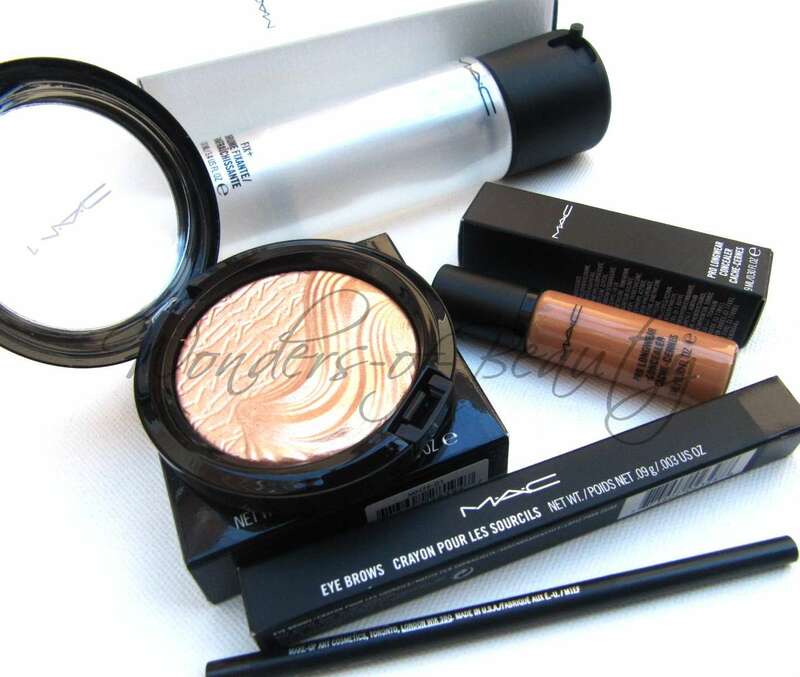 First stop was MAC (bought from Debenhams)! 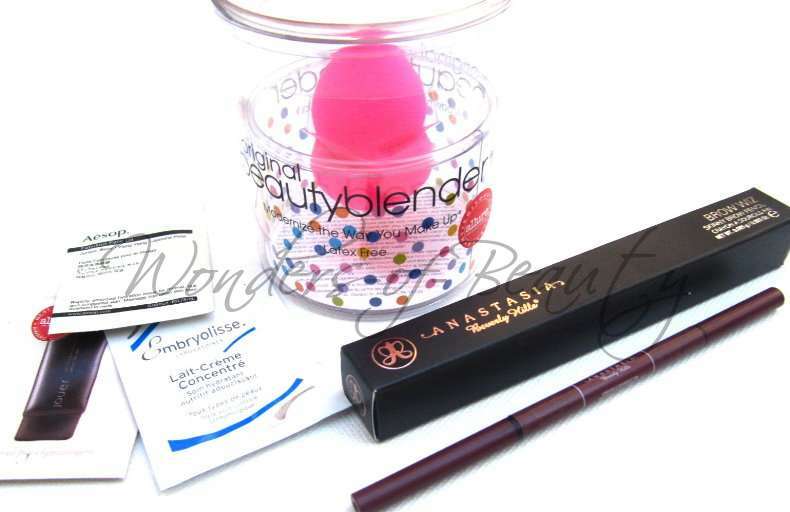 I repurchased my eye brow pencil in 'Stud' and also my undereye concealer Prolongwear NC42. I'm not sure if it's just me but this Prolongwear concealer NC42 looks slightly off in colour compared to the two bottles I've previously owned. Maybe MAC have altered the shades from this range or maybe they just changed their NC42? I don't know what they've done but the colour definitely looks a bit different and I prefer the old shade. Has anyone else who usually uses Prolongwear concealer noticed this after a recent purchase? After taking a break from MAC Fix + as it wasn't a necessity, I decided to repurchase it to use with my new Beauty Blender (featured later in the post). I also managed to get my hands on MAC Whisper of Guilt Extra Dimension Skinfinish. Thank God they decided to re-promote it in the Glamour Daze Collection because I was wasting time contemplating and I missed my chance to get it before when it was a limited edition release. I've never been one that's really into body scrubs but my mum purchased this for me from GADI21. Those who pass through Bond Street Station may know of this brand or you may have even been sweet talked into buying their products. I remember being persuaded into buying their Dead Sea Mud Mask for £50 a few years back. 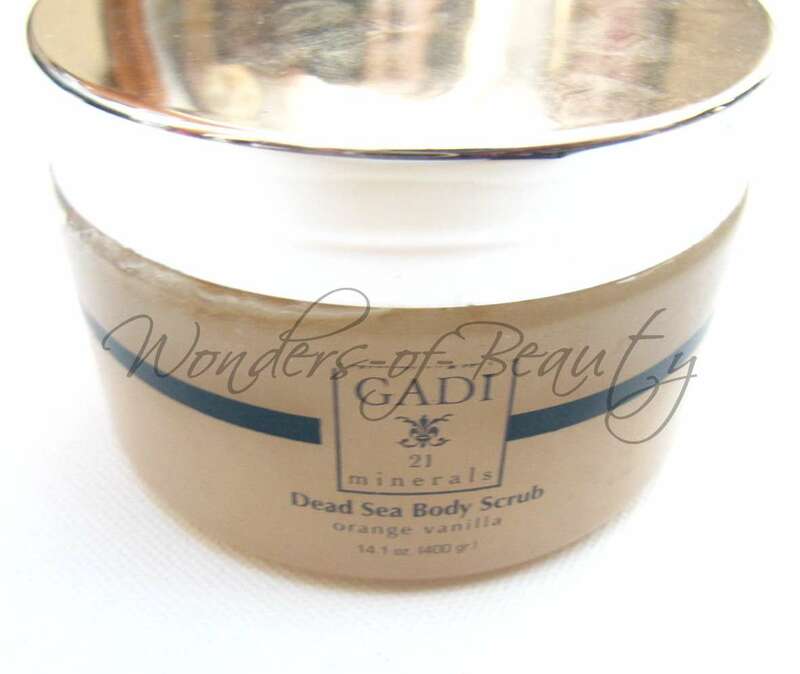 As the Dead Sea Body Scrub is an exfoliator, it is said to enhance skin renewal and refine and resurface the texture of the skin. Last but not least, I made my first Cult Beauty purchase. Anastasia is said to be a popular brand in Hollywood with the likes of Kim Kardashian using her products. I can't remember which brow product from the Anastasia range that Kim Kardashian uses but I remember seeing Anastasia on her blog. I've also heard PixiWoo talk about the brand. Even though I've recently bought my usual MAC Eye Brows (first picture) as a backup, I decided that I wanted to give Anastasia a try. Cult Beauty are the only UK Stockists that I am aware of but I will say getting hold the 'Brow Wiz' has proven to be very difficult on the site. Every time I checked, the colour 'Brunette' was sold out and obviously out of the four shades, this is the only one I can go for as my hair is dark. Eventually I managed to grab it whilst it was in stock. Whilst I was at it, I also bought the original Beauty Blender which I have been planning on buying for a long time now but I could never understand the price! My order came with three samples which you can choose from a range at the checkout: Aesop - Fabulous Face Oil, Embryolisse - Lait-Creme Concentre and Jouer - Luminizing Moisture Tint in Deep Bronze. Has anyone tried any of my new products? Would you like an in-depth review on any of them? Just thought I'd also let you know that Sigma are doing free worldwide shipping for Black Friday until 11:59PM US CST!